Shopping for clothes is often a fraught experience for many women. It can be so hard to go shopping and actually find the clothes you want, the clothes that fit, the clothes in colours you love and that flatter you, and the clothes that express your personality. It's a big ask really when you think about it! 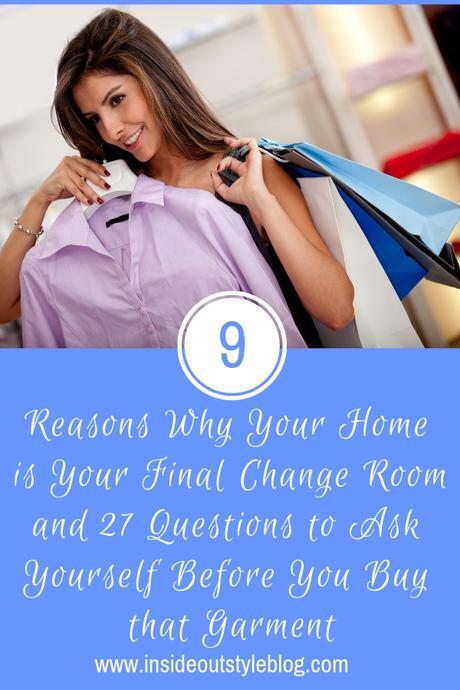 So let's look at why your home should be your final changeroom. Retailers use all sorts of tricks to encourage you to purchase. Sale Signs - you feel like you're getting a bargain - you may not be if you don't need it, it's not the rights shape, colour, contrast, fit, or it goes with nothing you already own. It used to be that sales were a twice a year event. So they were rarer and you had to wait to get something cheaper. Now you're conditioned to want to buy on sale, and there are sales everywhere, but they are time limited - so you have to get it now or it will be gone (and FOMO is a thing). High-Profit Items at the Front of the Store - yes the expensive stuff is usually at the front, the newest, the latest, the in-right-now items are at the front, catching your eye, and making you think that this is what you need right now. Bargain bins and racks outside the store to lure you into the store. Prices Influence - You're more likely to buy something that is $49 than $50 as it makes the item look like a better deal. Then of course, when you're at a higher end store, you're more likely to purchase the $50 than the $49 as the $50 item appears to be better quality. See an $800 jacket next to a $400 one - now the $400 jacket appears to be a bargain! Buy One Get One 1/2 Price - an offer you just can't refuse? So you're now buying two things instead of one and actually spending more money than you planned to! They play music to put you in the mood to have fun - and people who are having fun spend money! Vanity Sizing - Not all stores do this - but some do- and so when you're considering purchasing a pair of pants, the ones that are a size down from your regular size (even if they are more expensive) will more likely end up going home with you. Skinny mirrors - yes a slightly concave mirror in the change room is another way of making you feel like the item should be taken home with you. Friendly sales assistants - if you've been helped by a sales assistant, who seems so eager to please you, you're more likely to buy for emotional reasons (you feel bad for letting them down - all that effort they made). And did you know that if a sales assistant touches you, you're more likely to purchase from them! These are just a few of the tricks retailers use to make you stop and purchase. Jill Chivers has some tips on the devious tricks home shopping shows use to make you purchase here. This is why your home should be your final changeroom, where there are no retailers tricks going on. When you get the items home try them on again. Now that the emotions of shopping have gone, you are in your own home where there are no pressures. You can think calmly about the item and see if it's as great now as you thought it was in the store. When you bend and more is it staying in place or moving with you or against you? Will you start to fiddle or adjust the garment all the time or not? Will it need alterations? If so - are you happy to have them done (or do them)? How does it sound when you move? Is the colour good for you? Sometimes store lighting changes how a colour looks - does it blend with your colour palette? Is the colour contrast right for you? Is the value contrast flattering? Is it in your ideal value - or will it work with other items you own to create your ideal contrast levels? Is it flattering your body in a way that makes you happy? Do you like how it looks on you? Will it feel like work when you wear it? What kind of care does it need? Does it express your current Style Recipe? Do you have the lifestyle for this item? When and where will you wear it? Do you have anything similar in your wardrobe already? Is this a replacement for a worn out item? Is it better than what you have or is it 2nd best? Does it fill a wardrobe gap? Does it express your personality? Does it rate an 8 or more? Is it something you need? Does it work with other existing items in your wardrobe? Is it better than "good enough"? Will it help to keep you at your comfortable temperature? If it falls short on any of these questions above - is it something you really want to keep? If, now that you've assessed it in the clear light of day, you realise it's just not right, then take it back. It's wise to ask these questions whilst in the store so you bring home less unsuitable items, but sometimes emotions and retail manipulation still get the better of you so it's OK to reassess when you get home. If it appears to be a winner then it's on to the next step. Before you make a final decision about whether or not to keep this item, it's time to play dress-ups and create some outfits with your existing clothes to ensure that it really does work for you in the way you want. Sometimes you may purchase something with an idea in mind of what you'll wear it with (sometimes you just like something and buy it), and then discover that it doesn't go in the way you'd hoped it would, but you don't discover this until too late. Now is your chance to pair it with clothes you already own and wear to make sure that it does work, and that it will be a valuable addition to your closet. If you can make multiple outfits with the garment, you love how it looks and feels on, and it expresses your authentic style, then it's a keeper. If you realise that it's falling short then take it back. Rather than assuming that because you've brought it home it must remain yours. Think about your home as your final changeroom. Really, you've taken it on consignment (not beware that sales stock may not be able to be returned so you might want to ask those questions above in the store change room, before you get it home), and it should be returned back to the store if it's not something that is going to add value to your wardrobe. It's OK to return items that are not right for you. Assuming you're not a multi-millionaire where cost is not an issue, then you'll have the money to buy something else that is right and will make you feel great and look fabulous too. Shopping Strategies - Are You Better Shopping Alone or With Someone?